Holds 130 CDs, 90 DVDs, or 105 Blu-Ray cases. Sliding Dividers keep partially full shelves upright. These are necessary to move things along as quickly as possible. Plastic ends, held together with aluminum rods. Heavy extruded aluminum construction with rubber pads on bottom. Made in Canada. (1) Coolerguys Ultra Quiet 120x120x25mm Dual Ball Bearing Low Speed Fan. (1) Black 120mm Fan Grill. Insert completed cooler assembly in hole and attach with appropriate screws. Fan can be set to be either an intake or exhaust, simply mount the fan to the bracket pointing in the desired direction before installing (if you are looking at the label the air will flow towards you). 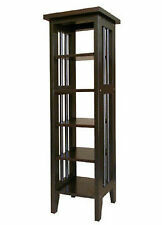 KALMAR MID CENTURY MODERN TEAK CASSETTE TOWER. 10.75" tall, 11" across & 10.25" wide. 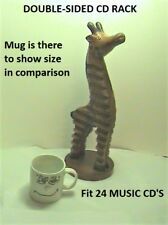 CDs fit perfectly - it can hold at least 120 standard CD jewel cases. Has Stainless Steel handles on both ends - allows for easy transport of shelf, even when full of stuff (you have to be careful not to tip it, of course). 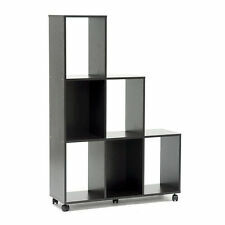 These are used IKEA DVD racks. Paint is mainly on the back of the racks. Manage your large collection of CDs or DVDs with style and convenience by easy mounting this shelf on your wall. Ben Burton Pty Ltd (Australian HiFi racks made by audiophiles). Here in Ben Burton we tailor solutions to best suite your beloved HiFi setup. At Ben Burton we are profoundly influenced by the love of music. Acrylic CD Rack Box About 13.5 x 27 x 15.5cm. Country of Manufacture: Unknown. Unknown how many CD's or VCR tapes it will hold. Pick up at our location after purchasing on this site. Great value and great service! s e ( 1469. If an item cannot be tested or is partially tested the details will be listed with the Item Actual Operation details. ). NEW TOMMY LARSEN PROSYSTEM CD 500 WALL MOUNT VERY SLEEK STYLE ALUMINUM MATERIALS MADE IN DENMARK. 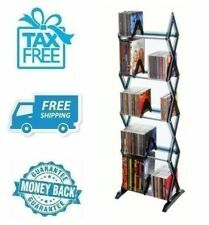 Avdeco Black Metal Dog / Wolf 8-CD / DVD / Decorative Media Rack - Fun & Quirky! Index cards to organize contents. CDBP-100 OP One-Touch Faux Leather CD/DVD Filling Storage. Push drawer and it will glide out slowly and smoothly, battery-free. Color: Pink. 50 see-through two-sided archive sleeves with numbered on top. Hold 150 CD and DVD with two-side sleeves in filing system. CDB-150 Faux Leather CD/DVD Filling Storage. Color: Red. 2 Slider dividers with rubber bumpers. 4 Hexagon double threaded expanders. Can be wall mounted or set on the floor but will still need to be fastened to the wall for stability. Hold 150 CD and DVD with two-side sleeves in filing system. Color: Pink. CDB-150 Faux Leather CD/DVD Filling Storage. Color: Pink. 50 see-through two-sided archive sleeves with numbered on top. CDBP-100 Faux Leather CD/DVD Filling Storage. Writable label on the upper portion of each hanging-file for easy access. Includes 50 pieces of 2-sided sleeves. OnTouch Inc. Portable 128 CD Case CDW-128 Disc, Green, New, LQQK ! 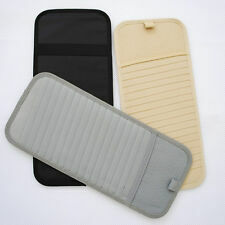 Hold 128 CD/DVD; Durable nylon material with outer zipper pocket. Durable unwoven sleeves with "CD won't fall-out" feature. Full CD-covered sleeves design without scratching CDs between pages. This is a set of four CD stacking cubes. They are made of plastic and have covers on the front. They also have grooves on the sides, top and bottom for secure stacking. Each cube will hold up to nine regular size CD cases or eighteen slim CD cases. Color: Violet. 50 see-through two-sided archive sleeves with numbered on top. CDBP-100 Faux Leather CD/DVD Filling Storage. Writable label on the upper portion of each hanging-file for easy access. Includes 50 pieces of 2-sided sleeves. (The stand shown in the pictures is the Large Stand - which can hold up to 130 vinyl record. Display your record collection without wasting tons of space! Custom Wood Laser Engraving. Anything you can think of :). Index cards to organize contents. CDBP-200 OP One-Touch Faux Leather CD/DVD Filling Storage. Push drawer and it will glide out slowly and smoothly, battery-free. Color Avaialable: Black, Brown, White. Index cards to organize contents. 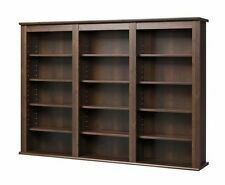 CDBP-200 OP One-Touch Faux Leather CD/DVD Filling Storage. Push drawer and it will glide out slowly and smoothly, battery-free. 100 see-through two-sided archive sleeves with numbered on top. VIDEO CASSETTE CABINET NEW IN SEALED BOX. 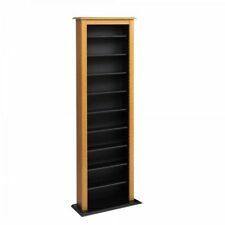 One Touch 60 CD Storage Tower, 2GR-60, Black, Brand New, Unique Design !